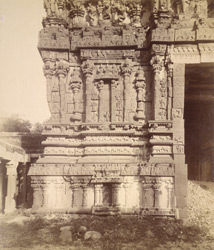 Photograph of the base of main gopura of the Venkataramana Temple at Tadpatri, Anantapur District, from the Archaeological Survey of India Collections: Madras, 1896-98. This complex was built during the Vijayanagara period in the mid-16th century. It is entered through a tall gopura in the middle of the east side of a rectangular colonnade. The gopura is a pyramidal tower richly decorated with sculptures and architectural motifs. The main shrine, dedicated to Vishnu, is preceded by a closed mandapa with two porches.